You know I love a bit of flash and fun when it comes to my life and that can be seen easily with what I made up for the Gacha Garden which just opened up on the first. This gacha is a little different, there is the main then there is the ‘seed of inspiration’ which is something that you get no matter what if you play the machine 20 times. Since my machine is a 50L pull that isn’t so bad really. It’s a nice touch, a guaranteed item. The other good part to this is the guaranteed item is a limited thing. It isn’t supposed to ever ever be resold after the event. Nice eh? My main part is the shoe chairs. The commons have 9 sits in each one, the rares have 9 sits and then 5 chair/stool type dances in them so you can be all flirty like or do some burlesque style. I like them, they’re fun. Imagine a strip tease for your significant other this Valentine’s hmm hmm hm? Awesome. So then there is the SoI that I added…. 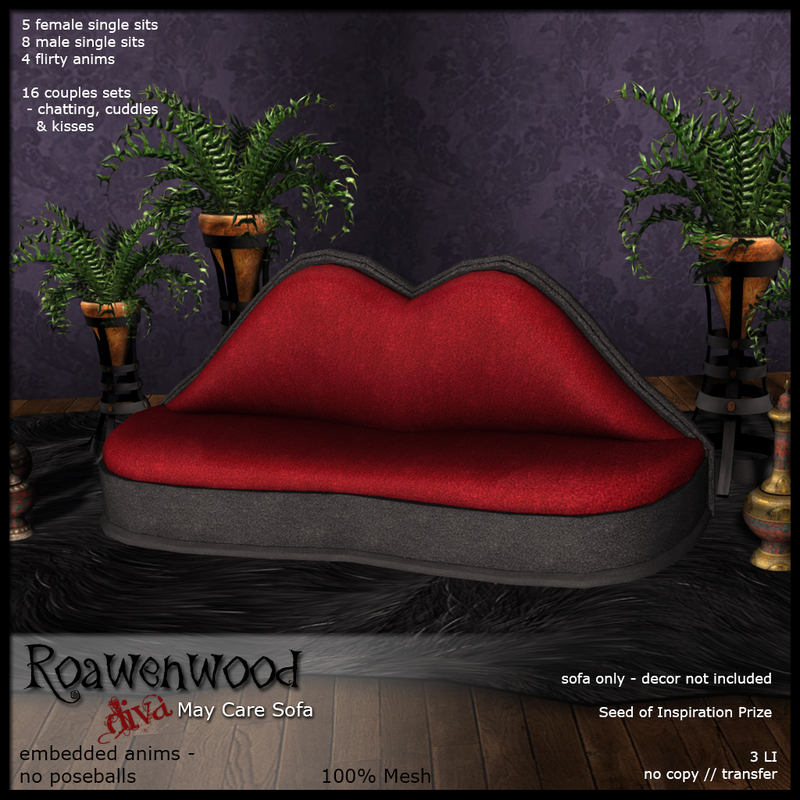 A sofa, lip shaped, they’re a lot of fun and I made this one to be fairly decent I think. 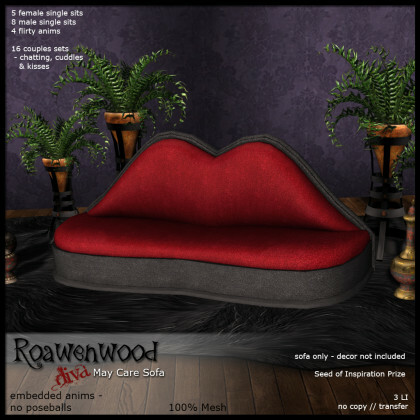 The sofa has multiple couples sets for cuddly, loving, and kissy…. not too adult, they’re all PG, and then a few seductive flirty type of animations… some singles stuff. Things for couples to sit and talk. It’s nice… and only going to be available through the end of the event so you need to get over there if you want it.